Ahhh, the Koch brothers and Koch industries… I don’t think we’re in Kansas anymore Toto, but Koch Industries’ headquarters are. Kansas is also the primary state where the economic outlook appears bleak, even on a sunny day, and perhaps past tax philosophy has something to do with that – where cutting taxes for the rich was permitted and without restriction, vastly going unhindered. Even the annual report for Koch Industries no longer exists online, removed, perhaps to hide some evidence? The economic storm that is about to hit Kansas can be traced back to 2011, when Sam Brownback officially became Kansas’ governor. The tax cuts that were rolled out to the more profitable companies and corporations – including their bosses – and the rich, saw a massive dive from 6.45 percent to 4.9 on income tax alone. By 2018, the plan is for a further drop to 3.9 percent. The bill was signed off approving this in 2013. Naturally, Kansas’ economy has plummeted along with the tax cuts. Along with this, credit ratings for Kansas have also plunged, with around 29 states currently in America, surpassing them. If you want to get into more figures, consider the slashing of education by 17 percent below pre-recession levels, which in 2015, saw two school districts close. According to a 2014 report, if Kansas doesn’t reverse these tax cuts for the rich, a mid-sized recession is predicted – and soon. “The tax cuts delivered lopsided benefits to the wealthy. Kansas’ tax cuts didn’t benefit everyone. Most of the benefits went to high-income households. Kansas even raised taxes for low-income families to offset a portion of the revenue loss; otherwise the cuts to schools and other services would have been greater still,” the report states. When Brownback signed off on the tax cuts, it eliminated income taxes on business profits “that are ‘passed through’ from businesses to their owners.” When he took office, the state’s budget deficit was only $60 million – impressive. Now it sits around $406 million just for the 4 years he has been in office – equally impressive but not in a good way. Also, Brownback has raised the taxes on the poor, allowing them to shoulder the burden of the withering economy. The tax cuts haven’t assisted the unemployment rates either, with them sitting at just a measly 1.1 percent growth in 2014-2015. The poverty rates also climbed, particularly for children to 14 percent after Brownback took office. It marks an all-time high since 2008. The Koch Industries sponsored Brownback during his election fight to office, giving him donations of up to $14,000, at the time. Immediately after Brownback won, (and not so long ago, was re-elected), the tax plans were rolled out. The governors preceding Brownback all had a gross state product higher than the national figures, yet Brownback’s has fallen to a miserable 3.2 percent compared to the national average of 3.9 percent. The average citizen in Kansas has felt the burden through health care, education, employment rates and general opportunities. In 2014-2015, it was documented that personal income has also almost ceased to grow, stagnating at 0.9 percent for anyone not in the agricultural business. 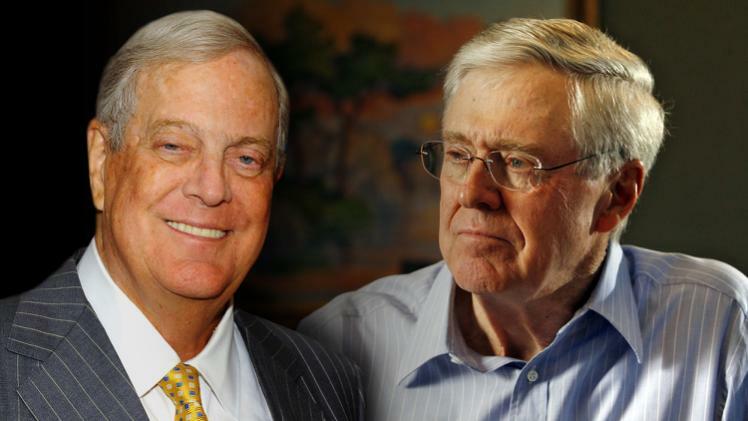 The Koch Brothers set out to fool the nation into thinking their economic strategy would benefit everyone. The reality is, without a tax system where all members of society have to contribute, the system eventually erodes. As played out in the past, the first to suffer are the lower and middle classes, with only the few super-wealthy to benefit. This ‘economic experiment’ just proves once more the corruption in a system that barely works. Those such as the Koch brothers – with their back pocket politicians – are just the iceberg tip of evidence that is hell bent on destroying a nation.